These creamy, buttery scalloped potatoes are the true definition of comfort food. 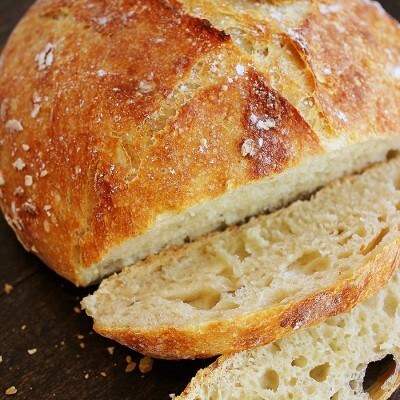 Perfect for weeknights or holiday feasts! As a kid starting out on my own after leaving home, I didn’t come away with an overwhelming number of family recipes. Sure, we enjoyed good meatloaves and mashed potatoes, roasted chickens and apple pies, but I was more excited to be able to eat Pop-Tarts for breakfast, lunch and dinner if I chose! And I did. But, as my thighs grew thicker and my wallet shrunk thinner from all the take-out and terrible decisions, I decided before not too long to learn how to cook! It saved me money, it distracted me from my boring college books, and I found out I could create some really damn delicious food. One of the first things I cooked for the guy I was smitten with (now my hubby) was scalloped potatoes. I remember lugging big, heavy handfuls of groceries into his apartment to make our own cozy Easter feast one April. I was still learning, so our glazed ham, creamed spinach and a little sweet potato pie for two were all pre-made. But the cheesy, creamy, melt-in-your-mouth scalloped potatoes? That is one thing I learned how to do from my home-cookin’ mama, and I learned how to do them well. I rolled up my sleeves, got slicing, and showed that man what he was missing! Fortunately, it was without knife injury or burning down his 1-bedroom that I accomplished my first scalloped potato side dish, and they were incredible. I think of that little Easter dinner and our tiny shared table every time I make these, and my mom, who taught me that the way to a man’s heart most definitely involves cheese! For a super cozy weeknight side dish or as an essential addition to your Thanksgiving spread, you’ll love this cheesy scalloped potato gratin recipe. It’s warm and comforting, full of flavor and easy to make. Using Sargento’s colby-jack cheese blend adds even more creaminess than cheddar, but use whatever cheese you like! Enjoy this one, friends, and won’tcha tell me below what your favorite food memory is? Preheat oven to 350 degrees F. Cut potatoes into 1/4-inch thick slices and set aside. In a medium saucepan over medium heat, melt butter. Add onion and cook for 5 minutes, stirring occasionally. Whisk in flour and cook for 1 minute. Whisk in milk, dry mustard, cayenne pepper and salt. Bring to a boil over high heat, stirring occasionally. Reduce heat and simmer for 3 minutes or until thickened, stirring frequently. 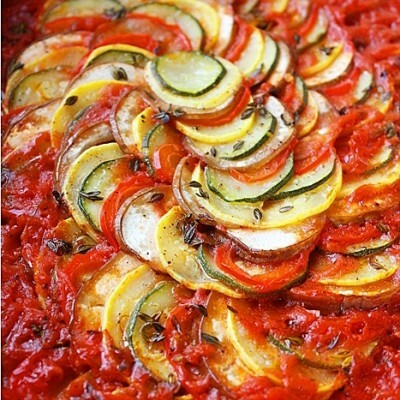 Bake for 1 hour, or until sauce is bubbly and potatoes are tender. Sprinkle with fresh parsley and a little cayenne pepper or paprika. Anything that involved cheese AND potatoes pretty much scores big in my book–this sounds AMAZING! I have to say, most of my favorite food memories center around my time abroad in Florence. Not only was the food incredible (obviously) but the time was just so magical. I loved it! Hav Mercy!! This looks AMAZIN!! Oh yes, scalloped potatoes are the way to most men’s hearts ;). Love the back to back cheesy recipes! 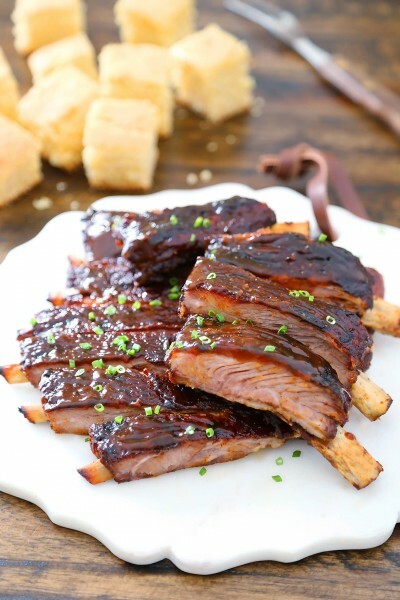 I will be bookmarking this recipe for the next guy I’m smitten with ;) One of my favorite food memories is the big Christmas Eve dinner with my family! Another classic, Gi! Why are yours so much prettier than mine? Ha ha! Dude, I’m totally loving this! Cheese and potatoes are my besties! 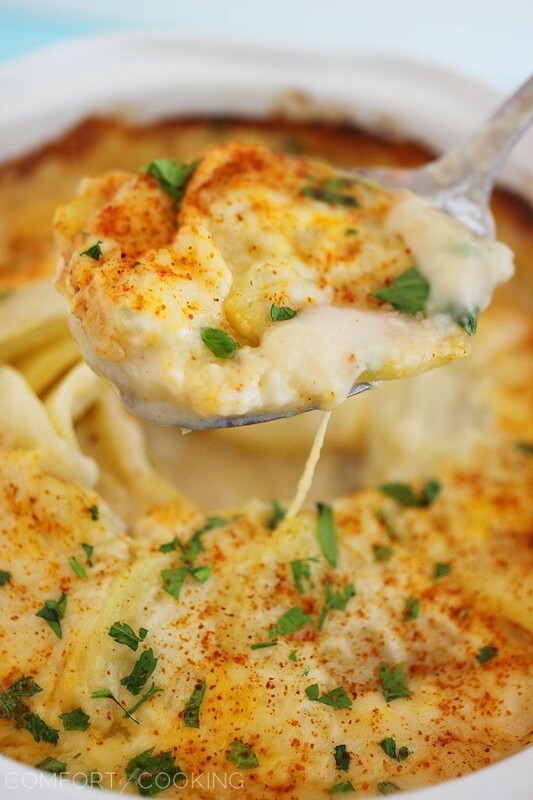 Cheesy potatoes are one of the most delicious things in the world, and these look SO amazing. NOM! I am surprised your hubby didn’t take one knee right on the spot that Thanksgiving! Seriously Georgia. Love all of the creamy dreamy cheese, pretty potatoes, and right-outta-the-oven goodness you have rocking in this dish. Marry me? Now I know why you call your blog The Comfort of Cooking. This is comfort food at its best. I love that you used Yukon Gold potatoes and a touch of cayenne to give it some zip. Wonderful recipe. I’d love to eat this entire pot. This gratin looks absolutely perfect! Love this recipe! I love scalloped potatoes but I’ve never made them before–bookmarking this recipe fo sho! Oh, yeah. This is comfort food at its finest. It would have won my hubby over, too! I really, really just want to face plant into that dish. This is…amazing! Mmmm cheese and potatoes… my favorite! Stunning spuds my friend! oh goodness, i haven’t had good scalloped potatoes in WAY too long. this looks amazing. 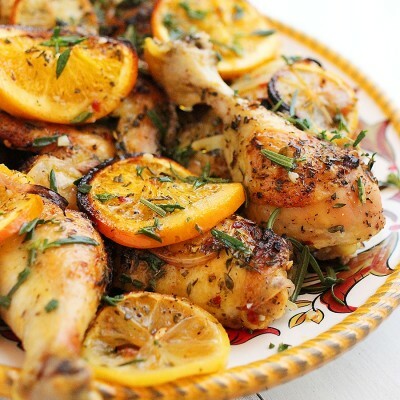 This looks amazingly good, it would for sure bring tears to the dinner table! YUM! 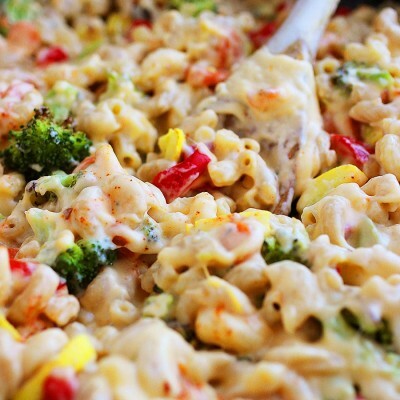 Awww, maybe Jason will propose if I make this cheesy goodness for him! Oh yum! I haven’t made scalloped potatoes in ages, but all the cheesy goodness in these is calling my name. And I imagine that the sprinkling of cayenne pepper adds the perfect kick. Thanks for reminding me of a childhood favorite! This is total comfort food. I’m totally craving potatoes at 7am. I love cheesy potatoes, Georgia. (how can you not!!) And how special is this recipe? The first homemade cookin’ you made for your hubs. Cherish it forever! Potato and cheese…a super comfort combo. The gratin looks satisfying and delicious. I suppose there isn’t a man out there that wouldn’t fall for these cheesy scalloped potatoes Georgia. I’m just glad you snared the one you wanted – lol! Today it is dark and gloomy here in the NE. A perfect day for a dinner like this! Yum! 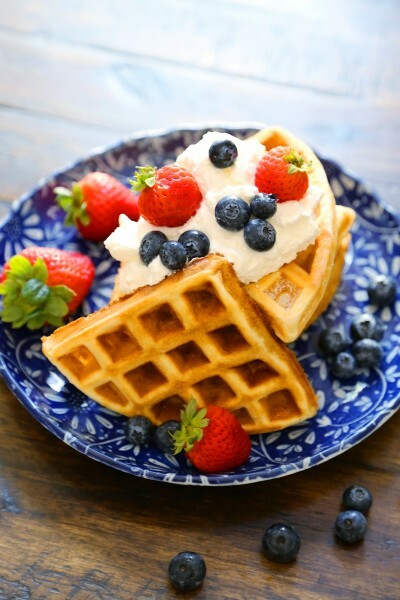 Can I have these for breakfast? My husband loves scalloped potatoes. These look wonderful! This may make you sad buuuuut, for Thanksgiving and Christmas every year we go to my grandma’s house. Love the woman, but she does NOT know how to cook to save her life. So my entire life for these holiday meals, we’d have turkey jerky basically (the meat was SO dry!) and boxed scalloped potatoes. So this is the really sad part: up until a few years ago, I didn’t realize you could make scalloped potatoes homemade.. in that, I didn’t realize it wasn’t just a boxed specialty! And oh my goooooosh I need to make this! It looks SO incredibly cheesy and luscious–the complete antithesis of the boxed fake version! MUST MAKE. There isn’t must better than a big dish of cheesy potatoes! Seriously drooling! 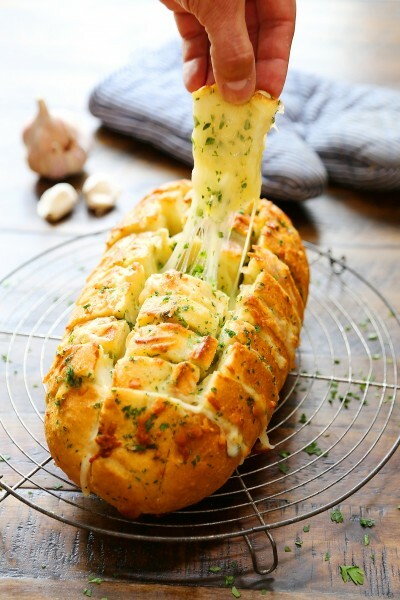 It looks so cheesy and amazing! I think I might make this for a Thanksgiving side dish!! 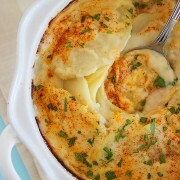 My Hubby loves scalloped potatoes too! With lots and lots of cheese! Love this comfort dish, Georgia! 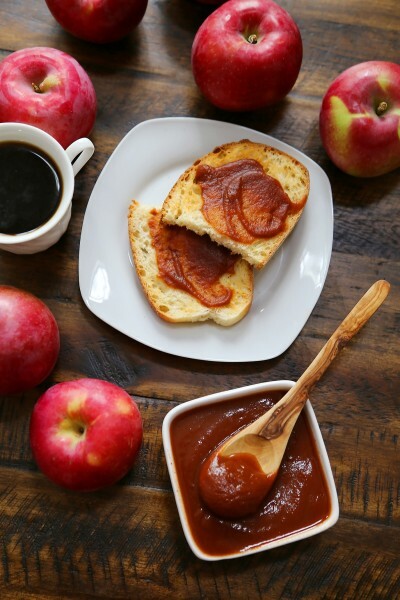 This is such a comforting dish, love it for the fall! These potatoes looks cheesy good delicious. I’m sure hubby loves it, look at how good it looks. Comfort food. Pinned it yesterday. Oh my goodness, lady, this looks TO DIE FOR! All that cheese!! Mouthwatering potatoes, Georgia! I’m sure they are absolutely delicious. Beautiful photos and awesome post! This story is proof the way to a mans heart is through his stomach. Love these cheesy potatoes. 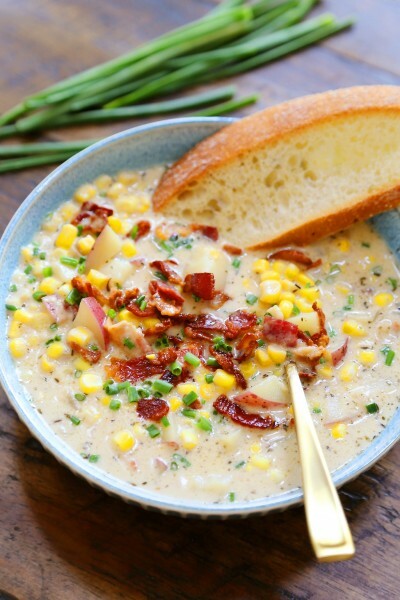 Now that is pure comfort food – love how you lightened it up with skim milk! 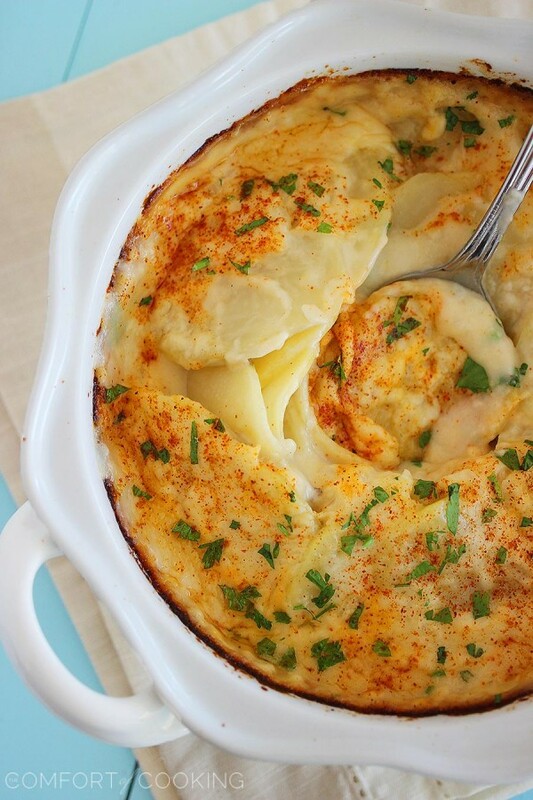 I cannot pass by a dish of scalloped potatoes, and these look especially cheesy and fabulous! 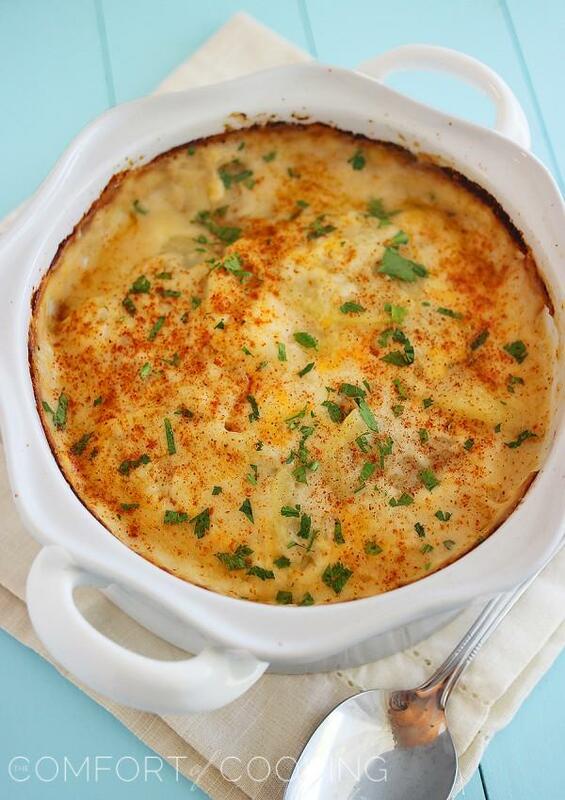 Scalloped potatoes are such a treat and who doesn’t love them!?! Cheesy potatoes! I’d fall in love with your food (and you) right away. =P YUM! I still get confused with the word “scallop”ed thinking there is scallop. Tee hee. gratin potatoes are one of our top foods.. Just love the cheesy flavor!! This is one fine looking recipe. I just fell in love with every part of this recipe. Creamy, noodles, cheese…warm and cozy food. Thanks for sharing. No noodles in here, but thank you for your kind comment! Love the sound of these potatoes…yummy I’m sure. Wow Georgia, I could eat these for the whole meal and not feel like I was missing anything. I love old fashioned recipes like this one especially when they’re not only delicious but bring fond memories each time they’re served. Perfect comfort food now that it’s getting a little chilly here in Orlando!! I won my hubby over with food, too! Love, love, love this!! Can these be frozen? If so, how should I do it? Thanks, look amazing! Just cover the baked dish with foil and freeze. These are AWESOME!! I used 1 cup of shredded cheddar and 1 cup of Monterey jack. LOVE! I’m hosting Easter dinner this year and have a hundred other things to do. I’m wondering if I could prepare this the day before and cook it the next day? Or should I cook it the day before and just heat it up? I’ve never made scalloped potatoes before.. Really looking forward to trying it out! Either should work just fine; cooking ahead of time and reheating at a low temp, or assembling ahead of time and cooking right before serving. Enjoy! I made this recipe tonight, after a random net search for scalloped potatoes (without heavy cream). It was perfect! Thank you so much! This dish was absolutely fantastic! Super delicious!! Every loved it!! Thanks for the recipe! I will make it this way every time. 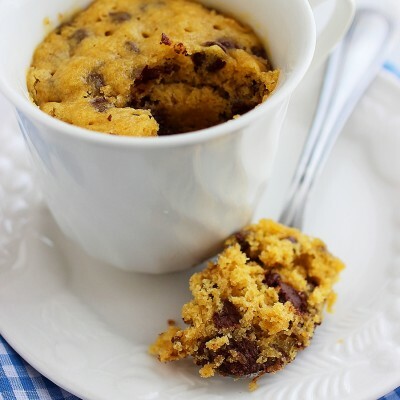 Made these today but used whole milk, They were a huge hit! I have made these twice now. They are amazing. I used 1 % milk one time and skim the other and they were amazing both times. I also beefed up the pepper a bit because my son likes the heat. Comfort food at its finest. When I initially commented I clicked the -Notify me when new feedback are added- checkbox and now every time a remark is added I get four emails with the same comment. Is there any manner you can take away me from that service? Thanks!